This game is made for the Pizza Jam. I choosed the sequence 231th, says I Am the Strongest! Around the sequence Machine, machine got the idea, of a game, where you should making coffee. And there were the titles: Black Thunder, A heart awoken from Darkness, Dark Finale, Dark Destroyer, Gone with the Darkness. But I did not want to make coffee a bad reputation. So I choose I Am The Strongest, based on the fact, that everybody think, the way THEY drink their coffee, is the best. 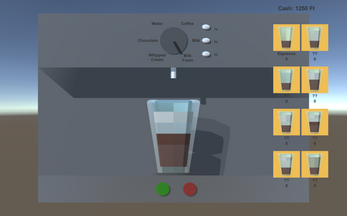 You have 6 ingredients, 8 types of coffees, and a green button to sell your coffee, and a red to trash it. Good luck, and pay attention to your money! !